Over the past year I’ve found myself planning more parties and doing less big DIY projects (like this one). As my toddler gets older I find it’s more fun including her in planning parties and creating DIY decor for the party with her than trying to cram busy projects into naptime and once she’s in bed for the night. I love all the details of putting a party together, however, with working 3 part time jobs and being a full-time stay-at-home-mom I often find myself missing little steps. I’ve started using a large whiteboard for planning parties and I usually end up sketching out ideas. 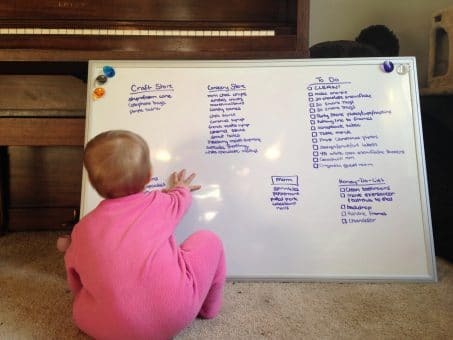 I’m pretty sure Clara’s learned that when the whiteboard comes out that means it’s crunch time! Although I love parties, they can be so overwhelming! All the to dos, to buy, and to make. I finally sat down and wrote out a complete list of major to dos on a timeline to keep me in track as I plan my next party. 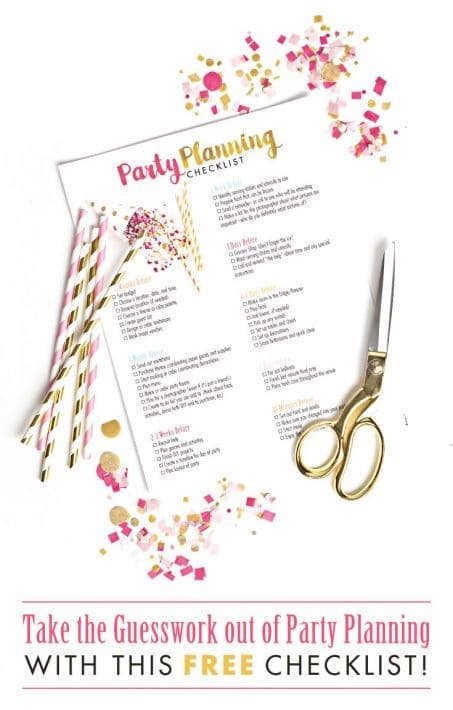 This comprehensive checklist helps take the guesswork out of party planning so that I don’t find myself the week before party day realizing I forgot to make party favors. Lucky for you, I’m giving it to you for free! To download your own party planning checklist just head right here. Also, if you love it as much as I do I’d love it if you shared it with your friends and fellow party-lovers using the links below. Thanks so much! SO FUN!! My daughter’s first birthday is in a couple months. I’m definitely going to need to read this! Fun!! I love planning first birthday’s!